Have you ever sought an answer for what you thought was a complex question, been given the answer many times and in many ways, but still didn’t get it? And when you did, it was so simple, you wonder how you missed it? Go back to your roots. To be clear, I’m not sure that everything that happens to us is for a reason, at least not one we’re meant to understand at the time. Sometimes things just happen. But when the message is overwhelming, it’s time to take notice. When I set out in 2014 for 12-18 months on the road, my intention was to study my non-Native roots and Indigenous wisdom, exploring roads in the Americas while also exploring who we are before we’re shaped by our culture. As a teenager, I’d disassociated with the particulars of the Protestant beliefs I was raised with, but never my family. One of the things I thought was not consistently addressed or practiced, was our interrelationship with all other life, something I thought I could learn from cultures that were way older than the one I’d grown up in. Thinking I could get personal information from family stories and research, I allocated only a short period of time to visit the Alberta farm where my father had grown up, not even considering the other places where my ancestors had lived. I’d planned to spend much more time learning about various Native American cultures. Discovering dad’s parents’ farm had abutted the Blackfoot Siksika reservation, and growing up he’d had regular interactions with them, seemed like more than a coincidence and a good place to start. Oddly enough, I was headed to Blackfoot Crossing, an interpretive center, and just about to cross onto Siksika land when I crashed. Although it was the most graphic, it was not the first time that week my plans to get there had changed. They were very helpful and understanding of my quest. Since I was headed back to Ontario, I was instructed to contact an Elder from any First Nation, offer a gift of tobacco, and present my question. In January, I contacted an Elder from Six Nations and after an extended and cordial conversation, I was told I’d need to get the answer from my own roots. Who we are is carried through our blood and I’m not going to find answers in another culture. I tried explaining I felt it wasn’t addressed and was merely trying to understand my connection to the earth, nature. But I’d had my answer. I was told to do my research and come back in a year. Dismayed but not defeated, I continued delving into my ancestry. A year later, I understood a lot more and had my focus was clearer. Everything on the planet has energy, including the earth itself. If we carry the experiences of our ancestors energetically, as I believe we do, then it stands to reason we also carry the energy of the land our ancestors lived on. Collectively, these experiences play a great role in shaping who we become. Stories of the land are carried by the Indigenous peoples. I thought I’d found the connection I was looking for. Again, I contacted the Six Nations Elder I’d spoken with, thinking she’d provide me with more insights, particularly since Six Nations is close to the land I grew up on. She was unimpressed and again sent me back to my roots. To be fair, I hadn’t had the time or the opportunity that is required to develop a relationship where these conversations can be explored, but I probably would have received the same answer anyways. It was what I was meant to hear. I did feel my contact in Alberta understood my quest better and was more supportive so in January of 2016 when it looked like I was getting ready to resume my trip, I contacted him to let him know I’d be in the area. I also advised him of my theory. He was most understanding and supportive. He told me of a big annual Pow Wow at Siksika in August and advised me to go there, offer a gift of tobacco, and ask to speak with an Elder. And that’s how I planned the dates for last summer’s Ancestral Trail motorcycle journey. Everything revolved around me being at Siksika from August 11-14. It meant riding 5,000 kilometers in just over a week, but it was doable. And arriving on the 12th would still give me enough time to seek out an Elder. Except there was a snag. I’d camped in Hinton, AB on the 11th and when I tried to leave the next morning, Trudy (my bike) wouldn’t start. I couldn’t believe it! At that point, I had no idea what was wrong. The only motorcycle mechanic in town was away at Sturgis. Between guys at the campsite, and calls to Echo Cycle, the closest Triumph dealer, 300 kilometers east, and Blackfoot Motorsports in Calgary, 600 kilometers south, we tried to figure it out. I had to get to that Pow Wow! Echo couldn’t guarantee they’d be able to fit me in that day, and even if they did, if they had to order parts, I’d be there at least an extra day. Things were looking glum, but in the end, it seemed like transporting Trudy to Echo was the best choice. With help from the fantastic folks at Griffiths Ford, I rented a transit van, we shoehorned Trudy into it, and I was off to Edmonton. The guys in the Service Department at Echo were fantastic and stayed late to help me out. By that time I’d figured out I may have filled the tank with diesel fuel the evening before. I explained my suspicion, which turned out to be right. They drained the tank, filled it with gasoline, and she started right up. I could be on my way the next morning, with two days of festival remaining. There’s a lesson about what happens when you feed yourself the wrong fuel, but we’ll save that for another time. The irony of the moment didn’t escape me. I was trying to get to Blackfoot country and my bike was stopping me. It wasn’t a big leap to remember I’d crashed the last time I tried. 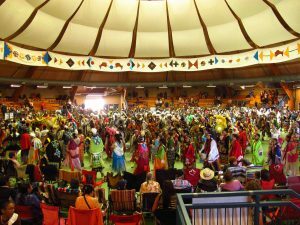 I hesitated about whether I should really attend the Pow Wow, going so far as to consult with my teacher. Convinced I was meant to be there I decided to proceed cautiously, paying particular attention to my intuition and noting anything out of the ordinary i wouldn’t have experienced had I not had this delay. I rode 350 kilometers south and found a lovely, quiet campsite right on the shore of Eagle Lake, close to the reservation and close to the land my father grew up on. The next morning I set out on my mission. It was an incredible festival, taking me back in time and place. Vivid costumes, dancing, singing, drum beats, people of all ages, the whole arena was pulsating. I waited and watched for a few hours, then sought out an Elder. I was directed to a Grandmother, sitting in the front row watching the festivities. She listened as I told her why I was there, that my ancestors had lived nearby and I was interested in how the energy of place had shaped me. “You need to find that in your family records,” was her response. I couldn’t believe my ears! I thought I must have worded my question wrong, so I rephrased it and presented my question again. Same answer. It was as if she hadn’t heard me. She asked someone to call over another Grandmother and had me repeat my question. The second Grandmother gave me the same answer. Unbelievable! Deeply discouraged and disappointed, I left the building. I’d planned for months, traveled all this way, only to come away empty. Outside I met the woman who’d kindly arranged the meeting. “Did you get what you wanted,” she asked? It took a few days for the light to go on, but when it did, it shone brightly. The answer was so simple. I’d distanced myself from my heritage at a young age, and lost sight of who I was. Whether I agreed with the religion or not, it is the blood of my ancestors and flows through my veins and their DNA that makes me who I am. It’s their experiences and how they responded to them, that I carry. Nowhere is the evidence of what happens when people are separated from their culture clearer than with First Nations or Native Americans. We’ve seen what happens when anyone is disconnected from their roots—the same thing that happens when a tree’s root system is interrupted. You lose sight of who you are. Inherently, there is much more to learn from Indigenous cultures about our relationship with nature, and how we treat the earth. But I had my answer for the time. It only took me two years and repeated explicit messages from different sources to get it. I didn’t need any more. To understand who you are, first go back to your roots. As it was, I was already immersed in my ancestral trail, with plans to explore it further during the rest of my trip. I didn’t learn many new facts about my grandparents, but I did get to know them at a whole new soul level. I’m only beginning to understand the richness of my heritage and understanding the stories I’ve been told about who I am. Creating my story for the rest of my life is still a blank page, written one word, one day at a time. “Go back to your roots” was the first thing I read this morning as I was waiting for the coffee to strengthen (French press). It was what I needed. It’s a good story about getting on track, and how you can’t rush things and what happens is meant to happen.I have a small men’s group. We get together once a month to talk about something we read or some current issue. Right now we are focusing on Stand Rock. I think your post ties in with that somehow. Earth as sacred, family roots as sacred etc. Thanks Liz. Great tie in Gary. Earth as sacred and what happens when we don’t see ourselves as part of the whole. Thank you. Thanks Joan! Hope you’re doing well! 1 Pings/Trackbacks for "Go Back to Your Roots"